The practical, roomy, versatile, family van has been wrongly stigmatized with the moniker ‘soccer mom’s’ car. To those critics, the Ford Transit is by extension the ‘soccer team mom’s’ car. How else would those less resourceful observers describe a 12-passenger van that can also carry all of their gear? Perhaps airport shuttle bus? Commuter bus? Senior center bus? Mini school bus? The Transit Hi-Roof passenger van is all of those and much more. The Transit series replaced the venerable Ford E-series of vans in 2015. Still a rear-drive layout, the Transit comes in two wheelbase lengths, three roof-height layouts (standard, mid-roof, hi-roof), uses four passenger layouts (8, 10, 12, or 15-passenger), comes with single rear wheels or dual-rear wheels, can be powered by a 275-hp V-6 or a 310-hp Ecoboost V-6 that has 400-lb./ft. of peak torque, as well as optional CNG or propane fuel systems. Cargo van versions are similarly defined, with maximum tow ratings of 5,400-pounds plus payload capacities up to 3,680-pounds. Our XLT-trimmed Hi-roof van measured 235.5-inches long on a 147-inch wheelbase, while standing over 99-inches tall. Cab width is 81-inches—plus 18-inch wide mirrors on each side. While nothing says you’ve arrived quite like a standard back-up beeper, it is clear that this passenger van is not fitting in your standard garage opening. For further perspective, the Transit is the box that your normal minivan comes in. Slide the large right side door open (no power assist and no left side door available) and the vastness of the Transit is immediately apparent. Behind the forward cabin, the second row has three seats, the third row has 2+1 seats with a pass-through to the four passenger fourth-row seats. The view out is elevated and expansive through large tinted privacy glass, with ample head-room for access. Unlike the former Econoline vans, the Transit is quiet. The ride is actually very good too. If you’ve recently traveled and your rent-a-car shuttle was an old E-series bus that rolled, rocked, and rattled, know that this Transit behaves nothing like that. The forward cabin affords the driver a panoramic front view as well as laterally to each side. The rearward view—not so much. If you are unaccustomed to driving with your mirrors, the Transit’s tiny back-up screen will be of little assistance. And lacking rear wipers on those humongous dual rear doors (which open a handy 240-degrees), this van is begging for a mirror-mounted rear-view camera that operates all of the time. In sharp contrast to the family vans that populate America’s driveways, the Transit reveals its more utilitarian roots. After all, this vehicle’s creation was spurred by newer rivals like the Ram Pro, Nissan NV, and Mercedes Sprinter—which are far behind in the sales race against the versatile Transit. With the cabin stretching for every inch of space, the engine is more forward than in the E-series, so no big blob between the front seats. Yet the wheelwell intrudes slightly so the driver’s left foot has less space than in conventional vehicles. Hard, slippery plastic surfaces abound. So do beverage slots—up front. Each corner of the dash has a large pocket, up high, there are slots in the center dash and in the doors—eight in all. That is double the beverage pockets for the rear passengers. There is a cell-phone slot next to the steering wheel plus three power sockets/USB ports reside up front—with none in the rear. Two small manual flip-out side windows provide some extra rear air circulation on mild days. Impressively, the Transit proved to be far more nimble than expected. It is surprisingly easy to drive, with robust power on tap with the Ecoboost motor. The handling and ride composure were shockingly composed for such a large vehicle riding on 16-inch wheels, and the van cruises effortlessly. Fuel economy (no EPA rating) came in at 19-mpg. The contrasts inside reflect the ‘work’ roots of this vehicle. But some obvious changes would improve passenger ownership experiences. The Sync 3 screen with navigation, $1,595, is much too small (and pricey) for this application and difficult to make pinpoint touches while moving, the gearshift lever is too tall and intrudes on your hand passage to other controls from the steering wheel, while the lack of modern traveling conveniences in the passenger space begs for attention. Built at Ford Kansas City, the Transit commercial van starts at $32,285, rising to $32,755 for mid-roof design and $37,555 for hi-roof layout. Passenger versions are roughly $2,800 more respectively, with our XLT model starting at $41,705 before options brought the total sticker to $49,220. 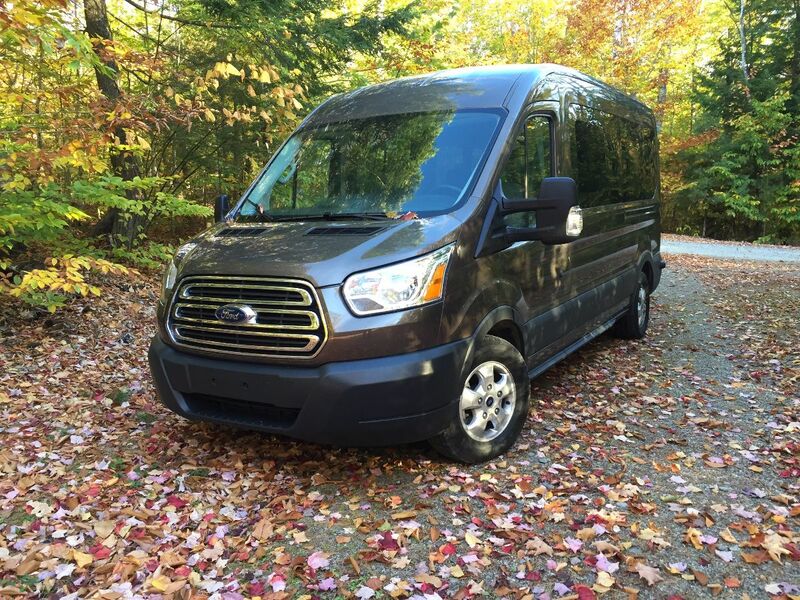 Ford also sells the compact Transit Connect cargo/passenger van series with four-cylinder power and 5, 6, or 7-passenger layouts with a front drive chassis. EPA-ratings for those vans ranges from 19-27-mpg. An impressive performer, the Transit just needs some more amenities refinement to continue dominating the full-size van segment.